Remove the center wheel ornament by pushing from the reverse side. 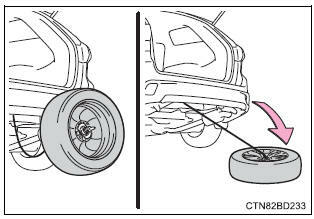 Stand the tire against the bumper with the inner surface facing toward you. 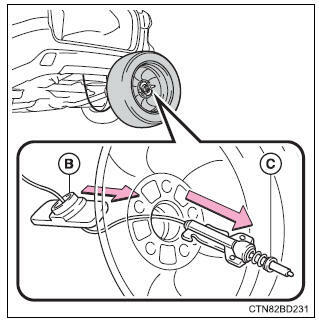 Pass the hoist assembly (c) and holding bracket (b) through the wheel opening. Fully depress the secondary latch (a) and install the bracket (b) to the hoist assembly (c). 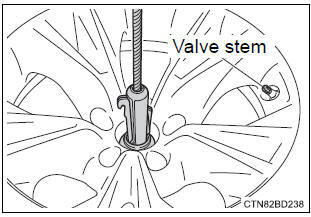 Lay the tire on the ground with the outer surface (valve stem) facing up. 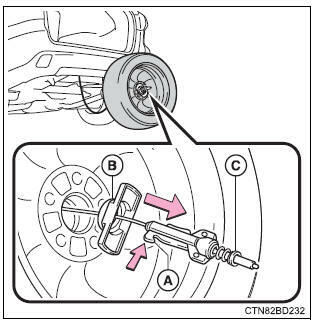 Using the jack handle and adapter socket, tighten the tire clamp bolt by turning it clockwise until the tire is in the correct position and two clicks are heard as the jack handle skips. Stow the jack and all tools.